Though mostly for die-hard Odyssey fans, this edition of the NIrV includes some valuable kid-friendly features. 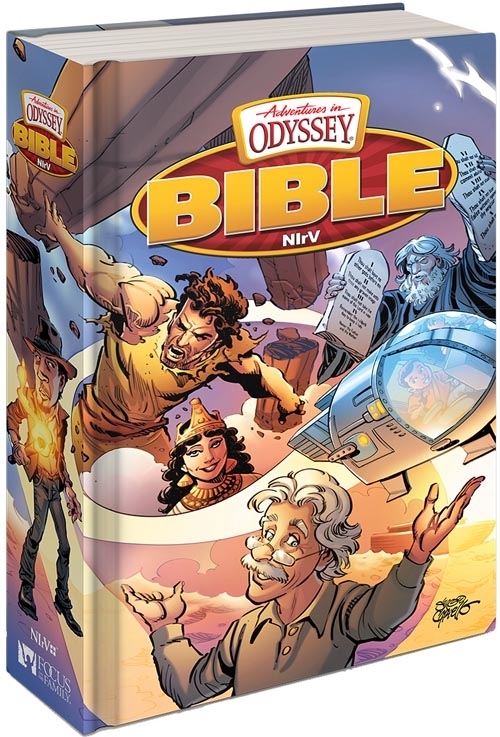 NIrV Adventures in Odyssey Bible. Focus on the Family, 2017, 1568 pages. If your kids have spent any time at Whit’s End, they’ll recognize old friends right away. 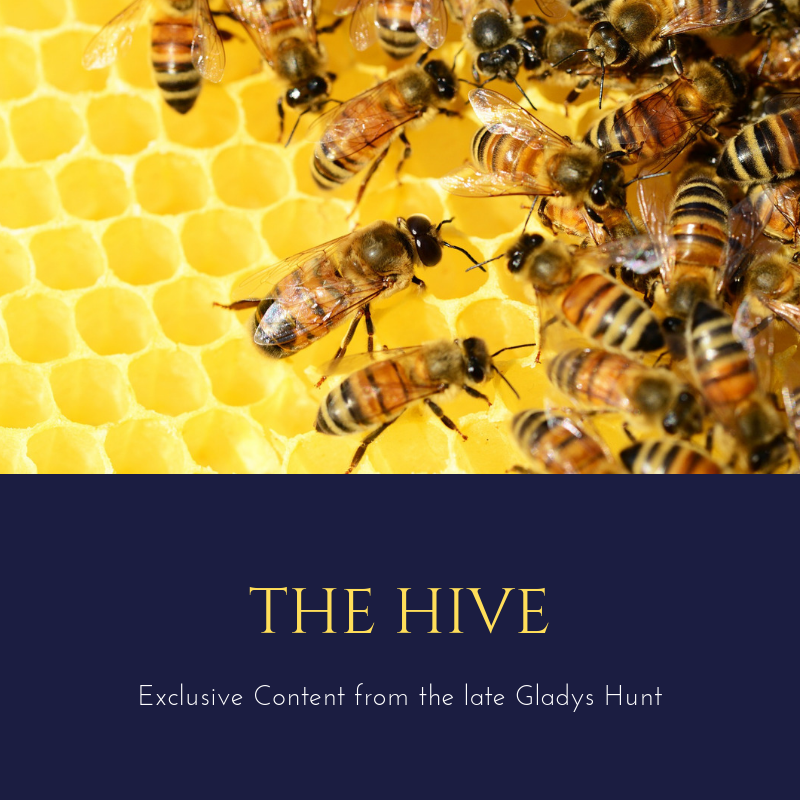 Odyssey characters pepper the pages of this edition of the kid-friendly NIrV. To begin with, each book of the Bible begins with a one-page introduction that summarizes the contents, then turns it over to Eugene Meltsner (“What’s It Mean, Eugene?”) to explain one key word or concept. On to the text, in which Jason (“Jason’s Jargon”) challenges readers to find a given word on a page, then supplies the theological significance of it. Wooton Bassett presents “Wooton’s Fun Facts”—some of them about the details in the Bible itself, and others about modern-day applications. 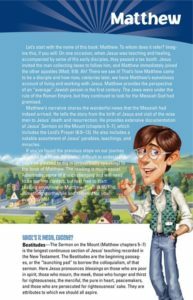 Connie Kendall’s “Candid Conversations” invite kids to think about their own relationship to God’s word, and John Avery Whittaker himself pops up with “Whit’s Wisdom” devotionals. Odyssey stories that relate to a particular Bible passage are referenced by number at the appropriate place in the text. 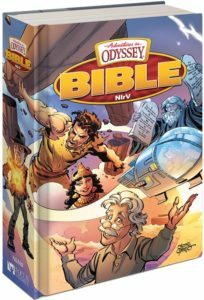 Eight Imagination Station adventures take the kids to full-color comic representations of Bible stories, illustrated by Action Bible artist Sergio Cariello. The appendix includes a Journey through the Bible Chart, a map of Old Testament events, and a Life of Jesus map featuring small pictures of Jesus. Finally: 52 key verses to memorize through the year. That’s quite a package, colorful, fun, and meaningful as well. The 12-point easily readable font is a plus also. How much use it will get depends on how much the kids love Odyssey, but if your family are faithful listeners to the program, it could be a good investment for encouraging them to get into Bible reading for themselves.